How to make perfume at home – Have you ever tried making your own perfume? It’s not too hard to make at home, as it turns out. Recently I went to the Bizarre Bazaar, a fair in San Francisco where independent sellers of the Etsy crowd sell handmade goods. 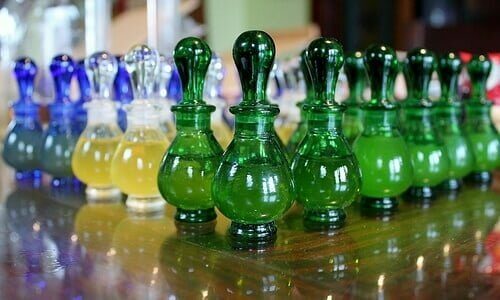 Amidst a motley arrangement of triangle-shaped earrings, bacon truffles, and wood cutting boards was the alluring fragrance of indie roll-on perfumes. As I sampled floral roll-on scents like lavender and rose, I felt the DIY itch to create my own personalized perfume. A plant or a combination of plants whose scent you’d like to capture through distillation. Some scents to consider are rose petals, citrus leaves and blossoms, rosemary, or jasmine. Leave out any stems, as this generally spoils the scent. Pick your intended plant scents when they are most fragrant, and be sure that they’re aired out until limp but not dry. Leave the leaves and petals intact as there is no need to crush or chop them. Place the plant material into your Mason jar. Pour the grape alcohol or Everclear over it until the alcohol touches the top of the material. Swirl or shake the jar a little bit to allow mixing. Place your jar away from sunlight, in an area that’s at room temperature. Let it sit for a day, then strain the plant material through the netting, being careful to preserve the alcohol. Add more plant material to the Mason jar and pour your already-infused alcohol over this without adding more. Do this at least six times – you may need to do it more than two dozen times until the product is finished. Before you can use your perfume, it has to be diluted with oil, making what’s called a “perfume oil.” First, pour your jojoba or sweet almond oil into a clean dark colored glass bottle. Then add about 25 drops of your essential oil(s). Mix different kinds of essential oils in different amounts and different orders to experiment with your fragrance! Let your concoction sit for at least 48 hours until use. To make the process easier, you can simply buy essential oils instead of going through the distillation process.